An authorized IBM reseller since 1993, BCNI sales staff is well versed in tower, rack and blade server models sales and support. BCNI sales can assist you in all aspects of planning your server implementation. Looking for a basic small business server? BCNI Oakville recommends Lenovo TS 140 tower servers. 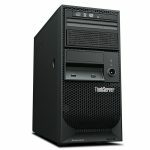 With an Available Xeon E3 processor and built in RAID 5 this series of server is well suited for the small business looking for a basic server. Priced from $600. BCNI recommend the Lenovo Series X 3650 rack server. With dual Xeon E5 processor capability and support for up to 18 internal Hot Plug SAS hard disks this server is our best seller amongst mid-sized clientele with growing storage and processing demands.